Guanajuato is one of the 31 states which, with the Federal District or Mexico DF, comprise the 32 Federal Entities of Mexico. It is divided in 46 municipalities and its capital city is also called Guanajuato however, the largest city in the state is Leon. 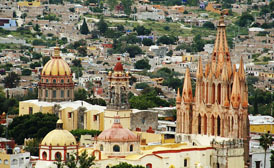 Guanajuato is just one of over 60 official online guides covering the whole of Mexico. If you´re planning a trip to Mexico and would like discover our fabulous nation before visiting or, if you´d like to visit a specific place in Mexico, then you´ve come to the right place. Guanajuato is located in the North-Central Mexico. It is bordered by the states of Zacatecas to the northwest, Jalisco to the west, San Luis Potosi to the north, Queretaro to the east and Michoacan to the south, the state covers an area of just over 30,000 km². Guanajuato is sandwiched between the arid north of the country and the greener south, and it is part of the Volcanic Belt called the Trans Mexican fault, the Sierra Madre Oriental and the Mexican Plateau. 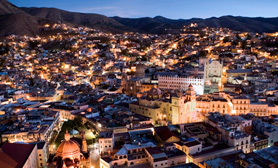 Guanajuato is one of Mexico´s most popular places, visited by millions of people over the last decade. When you travel to Guanajuato you may wish to check out the Guanajuato hotels we have available or maybe you´d like to rent a car in Guanajuato? 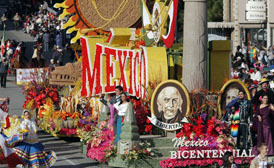 We also offer extensive Festival events in Guanajuato. This unique place has simply amazing things to see. We´ve also compiled a list of Travel books on Guanajuato Mexico. It was initially founded by the Spanish conquistadors in the 1520s mainly to exploit the abundant mineral deposits available near the now capital city of Guanajuato, however places such as the Bajio region later became important for agriculture and livestock due to their plentiful grazing lands and perfect temperature for farm animals. Traditional mainstays of the state’s economy include Mining and agriculture, but today, about thirty percent of Guanajuato’s GDP is derived from industry, which includes raw metal working, automobile manufacturing, leather items, mass market processed foods and clothing manufacturing. Guanajuato is home to numerous historically relevant cities, especially those along the, now famous “Bicentennial Route”, which follows the path of Miguel Hidalgo y Costilla’s insurgent army at the start of the Mexican War of Independence. For those interested in Mexico’s rich history the Bicentennial Route begins at Dolores Hidalgo, and traverses though the Sanctuary of Atotonilco, San Miguel de Allende, Celaya and the capital city of Guanajuato. Other significant cities in the state include Leon, the most populated and the city of Irapuato. Whether you are visiting Guanajuato in Mexico to see the Festival, for business, pleasure or both, we´re sure that Guanajuato will meet all of your expectations and that the people of Guanajuato will make you feel welcome while sampling some of the unique cuisine on offer in the Guanajuato Restaurant districts.